We love to transform your ideas into Salesforce solutions. We love iterating and prototyping on thoughts, unless it takes shape of required and desired solution ! 'Go live' can be stress free ! That confidence comes from experience of 10+ listed AppExchange apps. Happy personal life is important. We never bill a resource on more than 1 full time project, and more than 40 hours a week. Good technocrats only, no weak links. Single bad resource can pull down productivity of many others, when it comes to hiring, we are very choosy ! We know how to tweak best of Salesforce to give you maximum ROI. This confidence comes from experience (since 2008) and implementation experience for world's largest enterprises. We design solutions to pick up best mix of Salesforce licenses, and scalability for large data volumes. We are expert in customizing Salesforce beyond "point and click" i.e. via Aura, LWC(Lightning), Apex, Visualforce, Flows, Process Builder and Triggers. Our code(pages & triggers) don't fail in production, scalability is the foundation for any solution delivered. Our team was among early adopters of Aura (now Lightning), and we were among the first few Salesforce partners to list an Aura component (post-security review) on newly introduced AppExchange Components marketplace in 2015. We successfully shipped above 1000 Aura Components so far. Same passion continues with LWC (Lightning Web Components), a few projects are under development, more updates to come soon. Achieve new level of marketing success, with multi-channel customer journeys across email, mobile, social, advertising, and the Web. Our team is helping enterprises across the world, to make most out of Salesforce Marketing Cloud. Empower your customers, and partners without leaving Salesforce. We know how to give the best and most intuitive UX for customers and partners, and give your more ROI on Salesforce licenses. We delivered multiple successful Community Cloud projects using Community Builder using Aura components. We understand challenges with mobile web, and know how to deliver apps which works really smooth on Salesforce1 mobile. This confidence comes from delivery of many solutions comprising of Visualforce pages, Lightning components and latest of web technologies on Salesforce 1 platform. We have done it for more than 10 publicly listed apps on AppExchange. We are happy to be your team in this innovative journey, i.e. Brain Storming > Prototyping > MVP Release > Security Review > Public Listing on AppExchange. Please checkout our portfolio and get a feel of app quality we delivered for our own apps. Our USP is gorgeous and responsive UX in Aura, LWC and classic Visualforce, using best and latest web standards HTML/CSS, along with SLDS, Bootstrap, Angular, jQuery, Kendo, etc. We take pride in delivering screens, which are way beyond, just a mere dump of the database on the web page. We master Salesforce integrations with other systems 'securely', using SOAP/REST with XML/JSON over simple Basic or "OAuth 2" authentication. We have integrated Salesforce with popular APIs/Platforms like Amazon Web Services(S3, SES, EC2, Lambda), Google (Tasks, Calendar, Maps, Places, GeoCode, Charts), etc. Hybrid mobile development is new industry trend to maintain single code base for Android, iOS and Windows Phone mobile apps. Hybrid apps gets best of both worlds, with features like offline, finger print sensors and other native device capabilities. We master delivering the same using Ionic, AngularJS and Salesforce Mobile SDK. We delivered multiple apps for field service agents which work well in low network conditions. Is your consulting partner cheating you ? Save your hard earned money from going in vain. Why don't you schedule a solution review session with our experts. We will make sure your app is correct from architecture standpoint, and developers are following best coding practices. We met many innovators who opted under skilled developers, and missed "Go Live" because of multiple rejections in Salesforce AppExchange security review. Salesforce AppExchange is a marketplace serving apps for best enterprises in world, to keep up the trust they want your custom app to live upto security standards of Salesforce. If your development partner is struggling with security review, we are here to help, and done the same for 15+ ISV partners. "Me You There" makes it super easy to find the perfect place for your meeting. 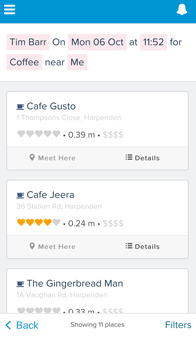 In just two taps you can find, book and tell everyone where to meet right from Salesforce1. 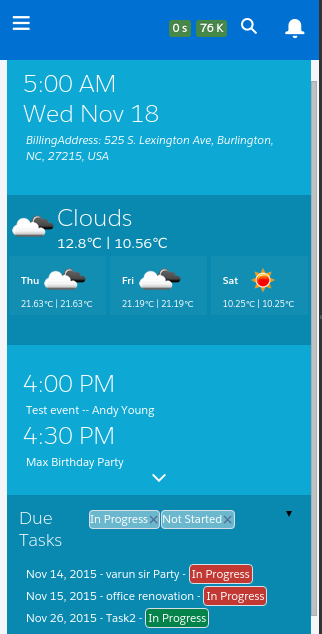 It's a Salesforce 1 and mobile first app, desktop version is in roadmap. This app started as our submission for "Salesforce summer of hacks" event in Bangalore (July'14). It's a single page app, hosted in visualforce, built using HTML5, AngularJS, CSS3, Bootstrap (SF1) and compiled using Grunt. Does it takes a lot of clicks + time to figure out local time of a given Contact, Lead or Account record. This component/app saves your time, by showing the current local time by adding this component to any required place. This app is a publicly listed Lightning Component on Salesforce AppExchnage. Because of heavy demand, we offered compatibility with both standard detail page layouts and Salesforce 1 Lightning as well. It works with standard CRM objects like Lead, Contact, and Accounts. It loads without any authentication or ask for user name or password. Saves your time to view debug logs i.e. via setup area or dev console. This extension is an attempt to make this use case simple, by making debug logs visible in 2 clicks, without leaving the current salesforce tab. 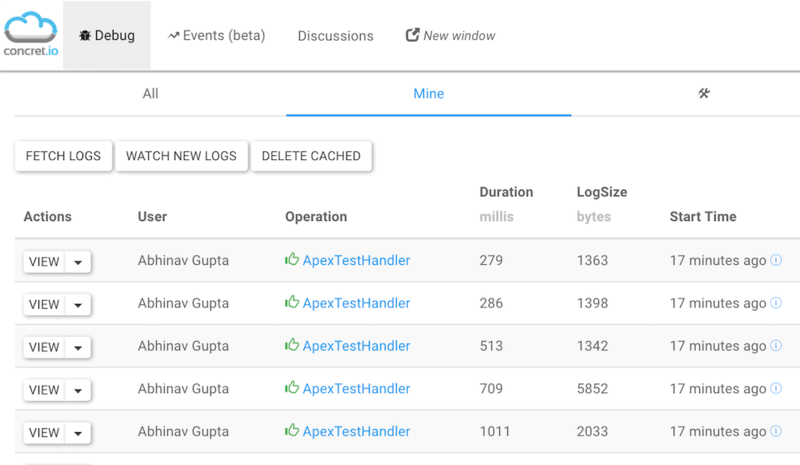 Plus, you get a better hierarchical view of debug logs, which are better to analyse. More features, like Execute Anonymous, Code Coverage, Test Cases are in pipe, will be released soon. Performs rollup on multiple such fields in a single aggregate soql query. Allows easy addition/removal of new fields to rollup as requirement changes over the span of time. Developer needs to write only a single trigger for multiple rollup fields. Allows developer to filter the child records getting rolled up, just like standard rollup summary fields. Apex wrapper on Apex DOM classes(Document, XmlNode). It exposes W3C DOM API for XML manipulation, which is pretty popular and known to most developers, so saves development time and cost on integration projects. It's pretty popular, and featured in Mar'10 Salesforce developer newsletter as well. It's an SOAP + Java + Salesforce integration framework to support transparent retrying of recoverable exceptions rather failing hard, and caching of session ids to save API calls. It's pretty popular lib for SOAP based integrations. It's is featured in Salesforce developer blog and book called Salesforce Handbook by Force.com MVPs Wes Nolte and Jeff Douglas. This is an Apex based lib from Salesforce team for enforcing security, especially in AppExchange apps. We contributed to some key enhancements in this lib, and actively advocate using for security compliance in AppExchange apps. Cherry picked videos from our team. "Game Of Thrones" character near my workstation ? Concretio Apps is a trusted Salesforce partner in two tiers i.e. PDO (Product Development Partner): We work closely with entrepreneurs, and transform their ideas as live apps on AppExchange. We know how challenges of AppExchange development, i.e. App should work across multiple Salesforce editions. App should be very secure to comply with Salesforce's security review guidelines. Multi developer & multi org strategy, to make sure app could be developed on time via multiple developers, without stepping on each others toes. This includes using code versioning and continuous integration tools like GIT, CircleCI/Jenkins. Making most out of trailforce, LMA(License Management) and release process. ISV Partner: We listed 2 of our own Apps and 1 Aura component on AppExchange Component Marketplace. Concretio Apps is having a strategic partnership with Cloud Consulting Group in DACH region. The aim of this partnership is to create a strong cross border pool of knowledgable experts, and resources to implement Salesforce.com projects with high quality and speed. Both companies rely on their respective strengths and combine them profitably for customers in Germany, Austria and Switzerland. Concretio was founded in 2013 by Abhinav Gupta (8 times Salesforce MVP), with a motive to build a team of passionate individuals, who want to develop high quality solutions, and enjoy challenges posed by rapidly changing technology. Hiring slowly, but good developers only. We start our 1st round with a coding assignment, which is followed by other “Live coding” sessions to eliminate any possibilities of hiring an underperformer. To stay updated with rapidly changing technologies and programming methodologies, we do internal trainings and use paid subscriptions from popular online learning portals like udemy.com, EggHead.io, and PluralSight.com, etc. We work 5 days a week and stretch once in a blue moon on weekends when urgent. We never bill our employees on more than one full-time projects to ensure 100% focus on one project only, and thus ends up in high-quality deliverables. We offer work from home to employees and they are given freedom to set their work timings as per the client’s time zone. We don’t change resources billed in ongoing projects, without letting the client know. For any reason, if a resource can’t be billed any further on a project, we give at least one month notice to the client, and offer him alternate resources to pick and interview for knowledge transfer and continuity. With Concretio, the resource getting billed is the one who is actually working on the project. Please fill in the form below to get the conversation started.